Short on the sides, party on top. I'm working up courage for a funkier 'do. It's not quite an undercut, but the sides are definitely tight with a really floppy mop on top. Flop mop top, if you will. My pixie cut is becoming an identifying feature. Although I had a short bob less than two years ago, most people have erased that from their memory and claim to have not seen longer hair on me in years. Decades. Lifetimes! Just as well; I feel so comfortable with short hair that sometimes even I can't remember life before the pixie. I like that it's distinctive, I like that it's a Look. Do you crave a Look? I always have. I'm fascinated by people with strong Looks. Most people I know get a Look through fashion, by creating a uniform or stylebook of sorts. They are preppy and nautical; rockabilly and retro; punk and edgy. It works for them. They identify through clothes. Or maybe big glasses or red lipstick or whathaveyou. I'm sure we all do this, to an extent, and a quick glance at my Pinterest board will tell you that I'd love to create my own Fashion Look. But most days, I keep it pretty simple. I tend towards basics and have learned to dress my body, including making sure my clothes fit well. For work, you'll find me in tailored pants or dresses with a cardigan on hand. On the weekends, I'm in jeans or leggings. It's consistent, but I don't know that it's a Look. The pixie cut, it saves me. It's a Look all on its own, even when I'm in my pajamas. (And in the morning, my hair puts on the best case of bedhead you've ever seen.) Add in big earrings, and BAM. Insta-Look. Plus, I've gained entry into the elusive and exclusive club of women with short hair. 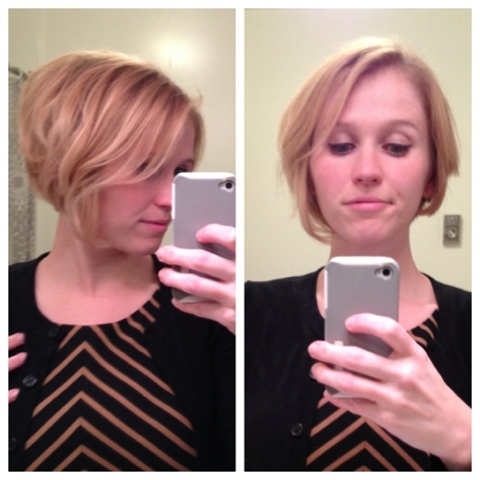 We check each other out, swiveling to catch the back of your own pixie cut to see how your stylist shaped it. We silently pass off pixie street cred to one another in line for groceries or on the sidewalk or at dinner. We make notes on texture and length and style. We know that we have a Look, and that we are rocking it. What's your look? What's your vibe? Hippy chic? Long beachy waves? Arm covered in tattooes? Or is this Look idea so overrated, superficial, irrelevant? Pixie cut update! Yes, I'm still rocking it. The 'do is a little bit longer than it was over the winter, with longer bangs and a different shape. It's also quite dark from the long winter, having just emerged from hibernation and having chopped off all of the lighter sunkissed bits! I answered a few questions about the ol' pixie cut over at It's Just Hair!, including what inspired me to go short and some of my favorite styling products. And of course, I riff a little bit about society's obsession with long hair and how you can still be pretty and glamorous with short hair. I couldn't resist. 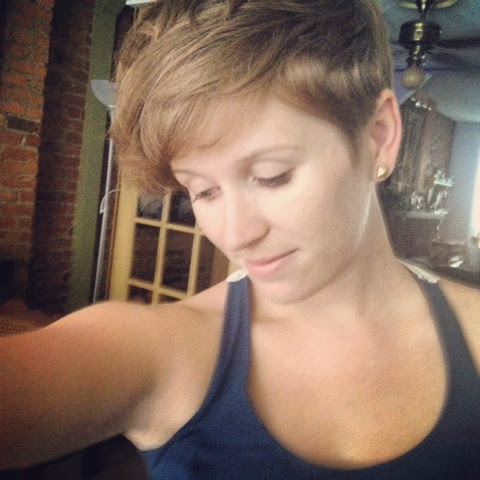 Thanks, Erin, for the opportunity to wax poetic about the pixie cut. As you know, I grew out my hair last winter and played around with a few different styles before deciding to once again return to the world of pixie cuts. I can't stay away. The pixie cut is so distinctive. Defining. Empowering. At first I left my bangs long and swept to the side. Then I cut it all off. I remembered my Pinterest board full of super short 'dos from Michelle and Emma and company and decided to crop it. I mean, really crop it. It was the shortest cut I've ever had and it took some getting used to. At least with bangs, you can kind of style them differently depending on the mood and they soften your look a bit. But with super cropped hair, that's it. It's just you, your face and the world. Out came the big earrings and loud accessories. I really liked my close cropped pixie cut. I felt so cool. So edgy. So rad. But here's the thing with short hair: even if you look awesome, there are people who will hate it. Who will tell you how much they loved your longer hair. People who will wonder, out loud, when you will get over this phase. They'll ask you what made you cut it so short. (Answer: I wanted to be awesome.) It's ridiculous, but it's reality. And you have to just remind yourself that haters gonna hate. It's good practice for the rest of life, isn't it? You can't please everyone and you shouldn't even try. Especially with your hair style. Because IT IS JUST HAIR. Just hair. Not a big deal. Who cares? No one. Except to be honest, I do care. I care about my hair. I care about looking (and feeling) good. That doesn't mean I have to look a certain way, be a certain size or follow a certain trend, but I want to feel comfortable in my own skin and in my body. So when I feel some negative pixie cut energy, I turn that nonsense right off and strut down the street knowing that I'm a badass lady with a badass hair style. It has been brought to my attention by Google Analytics that most people visiting this blog are only interested in hairstyle photos. Which is funny. It's actually hilarious to me. No matter what else I write, the views on those posts pale in comparison to anything from the pixie cut series. While I'm not rocking a pixie cut at the moment, I have begun to dabble in the exciting (?) world of asymmetrical hairstyles. Yes, it's exhilarating. I think I may be working my way back to an all-around shorter 'do, but in the meantime this is what's happening on my head. The color is a wee bit darker now than in this photo because, you know, it's completely sane to test out a new hair color one week before your wedding. It's subtle, but it gave me heart palpitations nonetheless. You all remember the beloved Pixie Cut Series , yes? Well here is a little update on the growing out process. My hair grows fast. 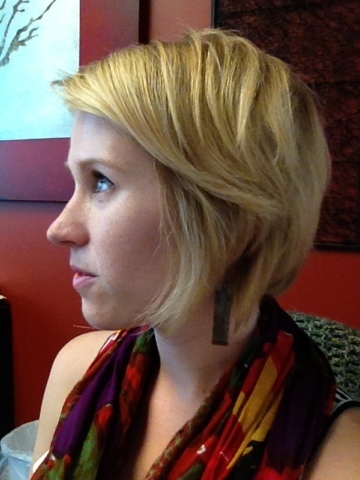 My last pixie cut was in December 2011. This photo was taken in July 2012, after two maintenance cuts to keep it at a short bob length. Long hair! All of the sudden I realized that it is no longer "Oh yeah, I'm growing out a pixie cut" but is just in full-fledged, vintage Christine chin-length bob mode. I mean, it's a bob! When did that happen? And look! I can even pull it into the world's stubbiest ponytail! For those keeping track then, it took me about seven months to completely grow out the pixie cut. Really, you could consider a shorter time but even when other people told me it was grown out I still think there were awkward bits for the last few months. Now I am completely satisfied that is has grown out. And now I'm also seriously considering how to chop much of it off at my next hair appointment. Or at least, spruce it up a bit.